Australia’s Sam Stosur on her way to beating Russia’s Anastasia Pavlyuchenkova on Thursday night. GARBINE Muguruza stands between Sam Stosur and the glories of the French Open's second week and the Aussie star knows nothing less than sustained excellence will suffice. As one of the strongest players in tennis, Stosur knows controlled aggression is generally the recipe to major success. But the US Open champion also concedes third Muguruza has oodles of power - and is never afraid to use it. The last time the pair clashed in Paris, Stosur was steam-rolled 6-2 6-4 in 2016. 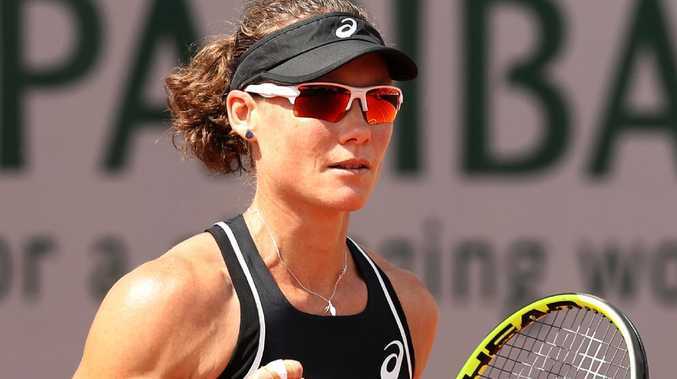 A tighter encounter in Brisbane last year and the Spaniard's comparatively mediocre form heading into Roland Garros has left Stosur optimistic she can derail the reigning Wimbledon champion. "Yeah, it's gonna be tough and she obviously plays very well here, and she likes it here as well. She's been in the top 10 for a very long time," Stosur said. "It's certainly going to be a tough match up for me but I'm certainly looking forward to the challenge. "She hits the ball very hard, flat and deep and I do remember in that match she was hitting really good returns, really close to the baseline which kinda straightaway puts me on the back foot. "So I think serving is going to be key, not that that's too dissimilar to any other day. "And I guess just trying to combat her pace of shot so I'm going to have to be aggressive as well." Seeded third, Muguruza wants to atone for last season's exit at the hands of Kristina Mladenovic - and not to panic as she occasionally does. "Well, my objective is to do things gradually," she said. Garbine Muguruza will be a formidable opponent for Sam Stosur. "I know that I'm in Roland Garros, and what I'm doing is I'm concentrated, I played two matches in two days, and obviously it's nice to lift a trophy. "But I'm still not there, and I just have to continue, go along. That's very simple." And she is wary of the firepower Stosur packs. "I have played her several times. She can be a very serious and dangerous opponent," Muguruza said. "She has won a grand slam. She is experienced in semi-finals here. It's going to be a tough match, but I'm looking forward to it." Muguruza leads Stosur 2-1 with the Australian's most recent victory coming on clay in Madrid in 2014.